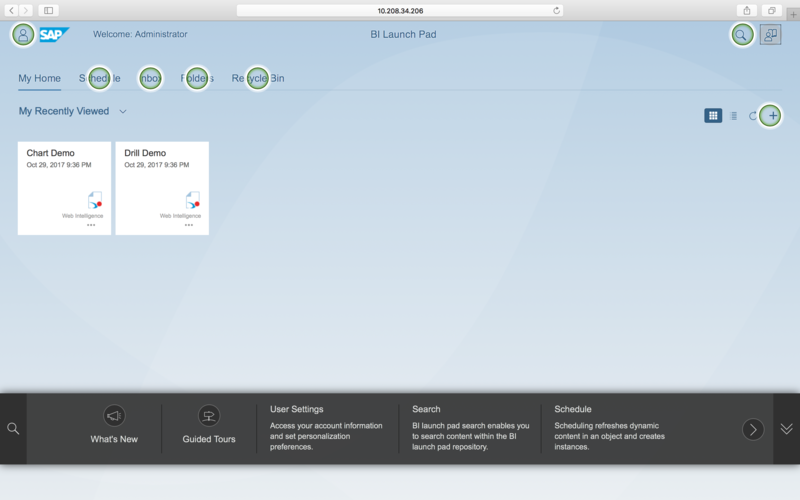 Web Assistant feature available in Fiorified BI Launchpad from SAP BOE 4.2 SP05 and Onwards. 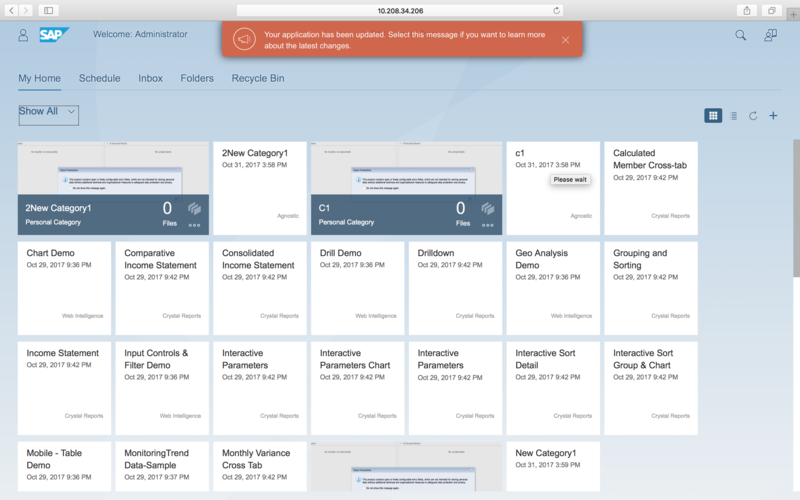 The SAP Enable Now Web Assistant is a web-based help system to provide context-sensitive user assistance. It enables users to get started quickly and to find all relevant information in an easy way without having the need to leave the respective application. When clicking the help icon, the Web Assistant provides additional information directly on top of the current application screen. Context-sensitive: Shows exactly what is needed for the user, depending on the current screen. 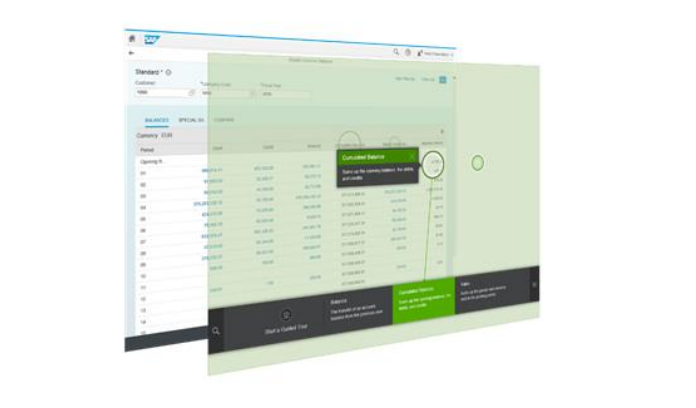 After you install or upgrade to SAP BOE 4.2 SP5, you need to configure proxy settings for a user to be able to access Web Assistant in-app help in fiorified BI launch pad. Proxy configuration is based on network settings in your organization. if this URL gives response then no need to set the proxy. else follow the below steps. Navigate to JAVA Properties of the web server. Add the https.proxyHost and https.proxyPort properties. 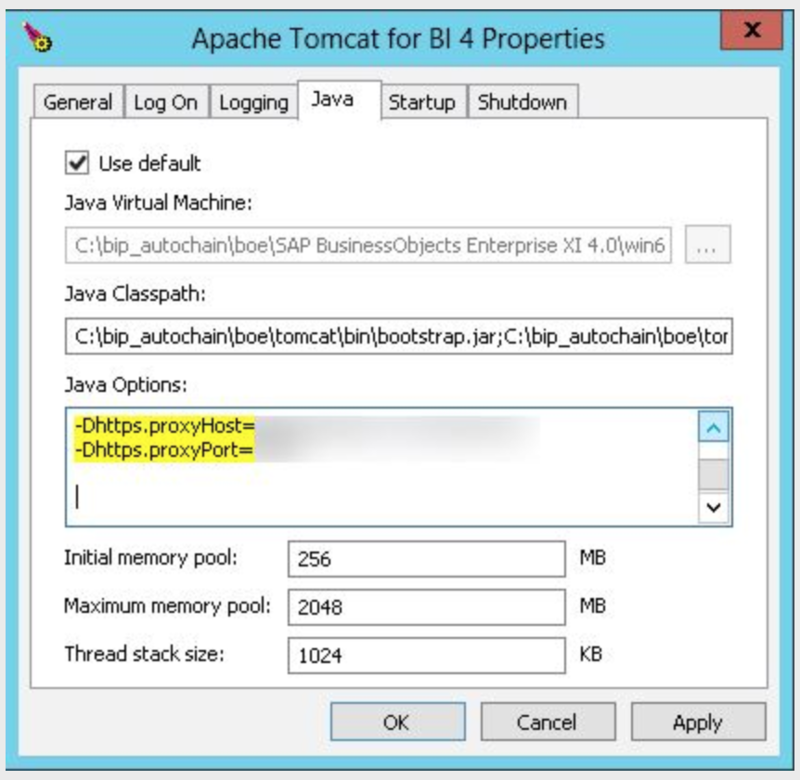 The Apache Tomcat for BI 4 Properties window opens. 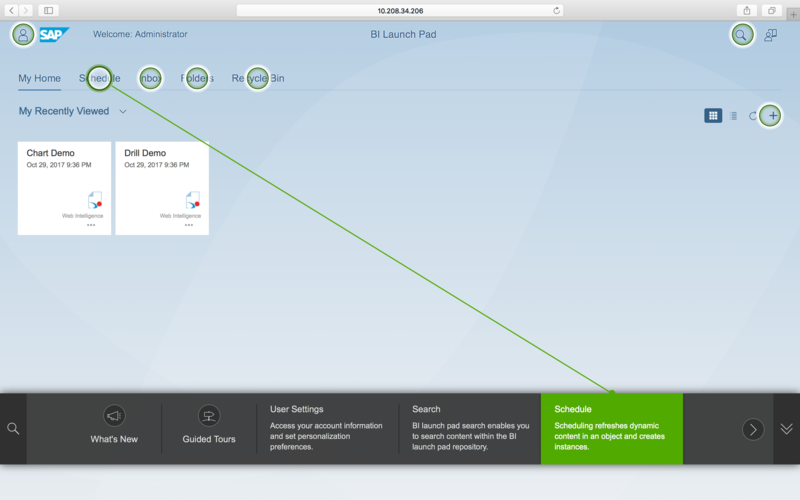 If application is updated and user is logging into the application for the first time after update – User can see the new features by clicking on the popup appeared on the screen. If user clicks on the elements present in the carousel area, It will connect to the corresponding hotspot. To turn off the Web Assistant, simply click on the Help icon again, and the circles will disappear. You can hide the carousel at any time by clicking on the double downward facing arrows on the right hand side of the overlay. Whether you hide or show the carousel is up to you. We anticipate that in the beginning, people will keep the carousel visible. This gives visibility to the user not just insight into the current control, but at least introductory information on adjacent controls which might also have in-app help. More advanced users, they may decide to hide the carousel altogether and focus on clicking on a circle as they need help. Not all elements are documented with Web Assistant yet, the number of topics will expand over time until, just about everything important is covered this way. Am I forgetting something ? In my environment, the machine can access the internet directly so I didn’t configure any Proxy in tomcat and IE and the Web Assistant works fine. There is an issue with web assistant config. What ports need to be opened in the firewall to make this work ? The video just points to some ip address who knows what that is ? IP and Port number showed in videos is “Proxy host and Port number”. Please check in your browser proxy settings where tomcat is deployed. Use command prompt to “ping” to proxy and update the same IP or host name in Tomcat java properties. The url in this note https://launchpad.support.sap.com/#/notes/2583902 is required to be accessible, but it doesn’t work from any network, external, internal…sap’s own network. So Opened a support request with SAP and the note has been updated with a work around. No proxy required and works. 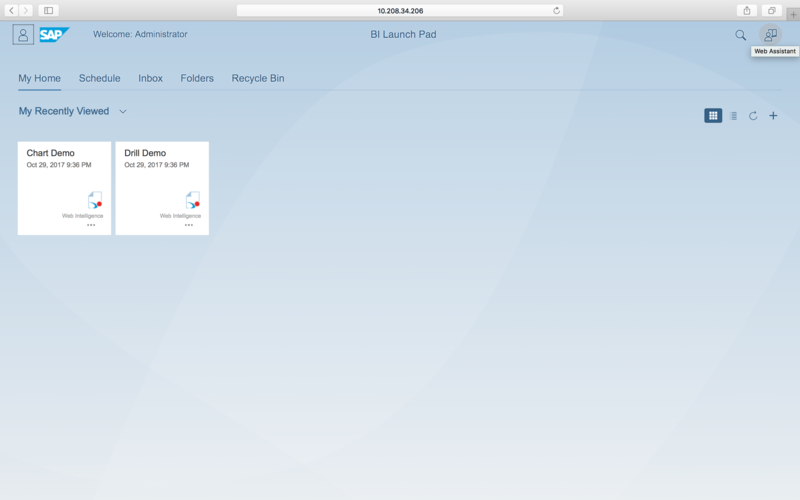 The URLs specified in the web.xml of the Fiori BI Launchpad are not accessible. Even after this steps getting same error then make sure Proxy Host and port is correct. 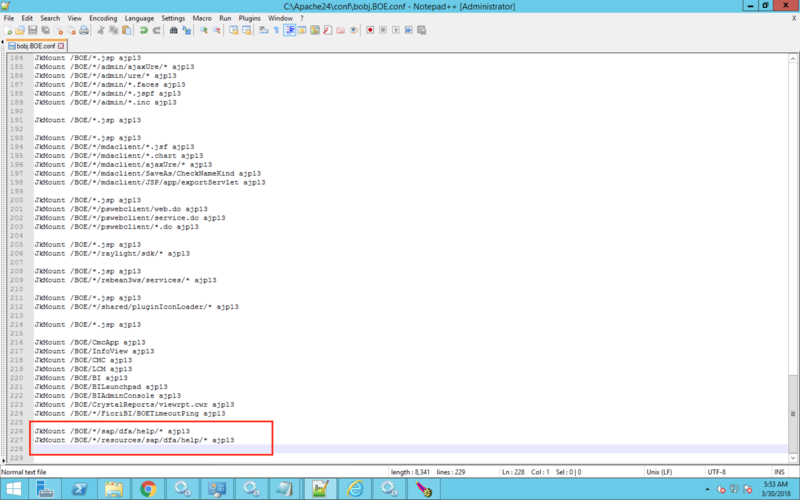 Fix will be available form SAP BOE 4.2 SP05 Patch2 +. I have tested the fix with the regular Apache Tomcat bundled with BO 4.2SP05 and it is successful. 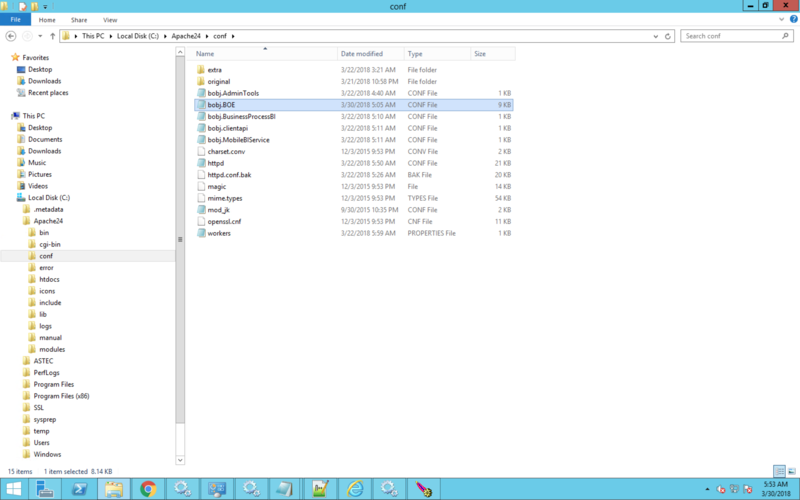 So, my guess is that there is something missing in the Apache config files. Have you tested the fix on a split deployment scenario? Any help is appreciated. I have also opened a ticket with SAP support but no resolution so far. I am back with my investigation. 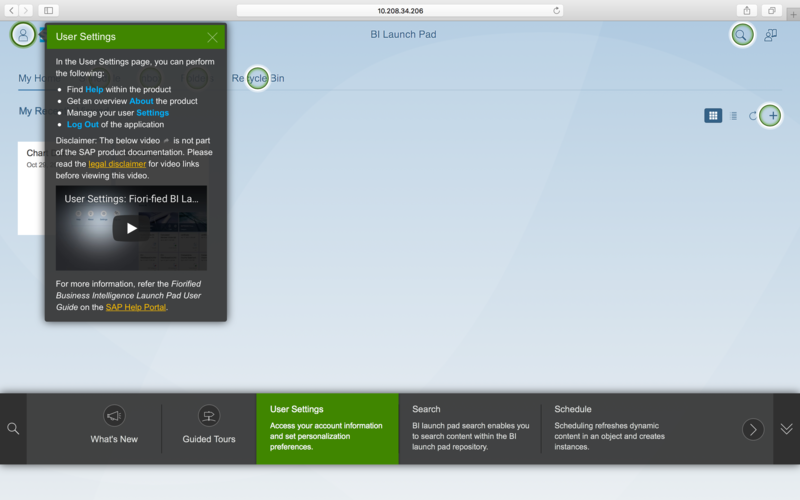 I am not sure if you have experienced or heard this before, but I logged on to the Fiorified Launchpad and it enabled the Web Assistant automatically. This behavior has not happened until today. Have you heard anything similar? It is odd, it logs you on, then web assistant just shows up. Is that happening consistently ? Thanks for the update Rene. I know the solution – and how you can disabel that annyoing thing starting itself up. Be sure to take a backup/copy of the original file! So, there’s no need to wait for SP07! Rene Brito :check below. Can’t contact you elsewhere…..
could you please check below URLs are responding from the machine where BOE Tomcat installed? No, I dont get any Respons. internet access is available in BOE installed machine ? no pages can be executed via internet explorer. Which steps have to be made? If these 2 pages are not accessible from the browser where BOE is installed then Web assistant won’t work. Internet access must be there from BOE installed machine. Is there a setting to deactivate web assistant as default when logging on Fiorified BI Lauchpad? Default mode should be inactive. Currently, all users are seeing web assistant active when logging on. we’ve configured it as described. the urls are ok as we’re already on 4.2 SP6. when attempting to connect to both URLs from a webbrowser that is configured with same proxy everything is fine. as per this Site, a authentication is required when using proxy server as per our case. is there any additional settings to be done on tomcat to handel this authentication requests? did you tried by adding these 2 parameters in tomcat java? yes we followed your instructions but no luck. this happens only if we call it over the launchpad. it seems that the application can’t authenticate, if the proxy is requesting authentication. if we call both URLs over the Chrome in the server where tomacat is installed we also get 407 Error code but then Chrome reacts and send the Credentials and then it works. Ideally proxy auth must take the parameters from Tomcat not with application specific.